Fully-integrated, quad-grip design guarantees safer and easier performance than any other plate on the market. Accurate within 2% or better of stated weight, Body-Solid Steel Grip Olympic plates are cast from the highest quality gray iron, creating an exceptionally strong and durable product. Feature baked on hammertoe gray finish that is durable, chip and rust resistant. Heavy lifting has never been easier or safer. Order your Body Solid 455 lb. 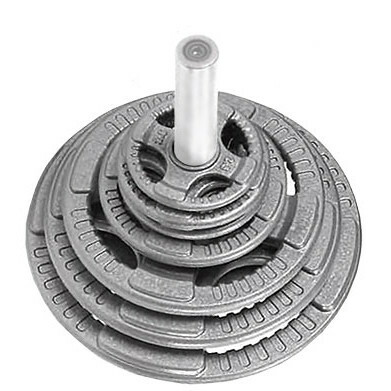 Iron Grip Olympic Weight Set from FitnessZone.com today!